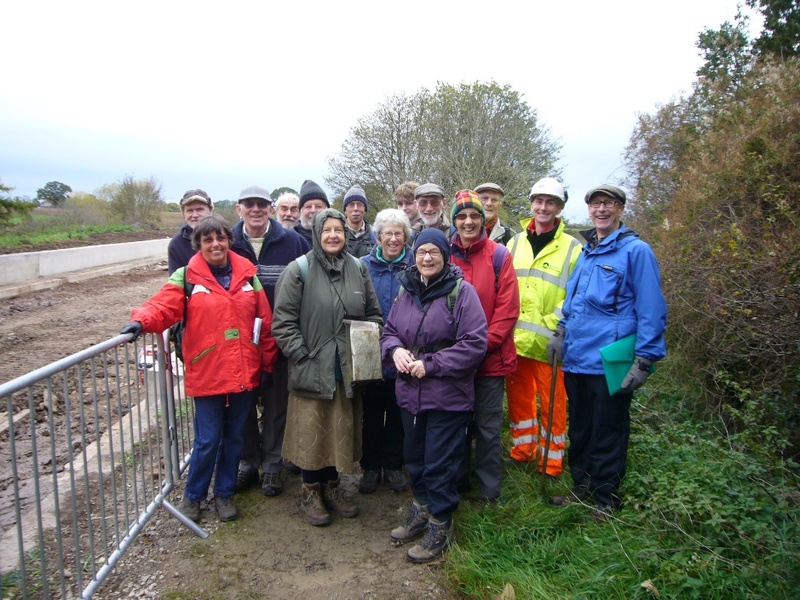 Fourteen brave souls ventured onto the Cheshire plain on Saturday 3 November for a little wandering around the Wardle Canal. Everyone managed to find the start point, despite yours truly mentioning the A53, rather than the A530, in the original note to members. If there is anyone still wandering up and down the A53, which runs between Shrewsbury and Buxton, looking for a group of itinerant canal enthusiasts then, apologies, you’ve missed the walk! Our circular route saw us starting on the Trent & Mersey in the north of Middlewich, then taking a cross-country route vaguely following the River Wheelock southwards until we met the two aqueducts on the Middlewich Branch of the Shropshire Union. 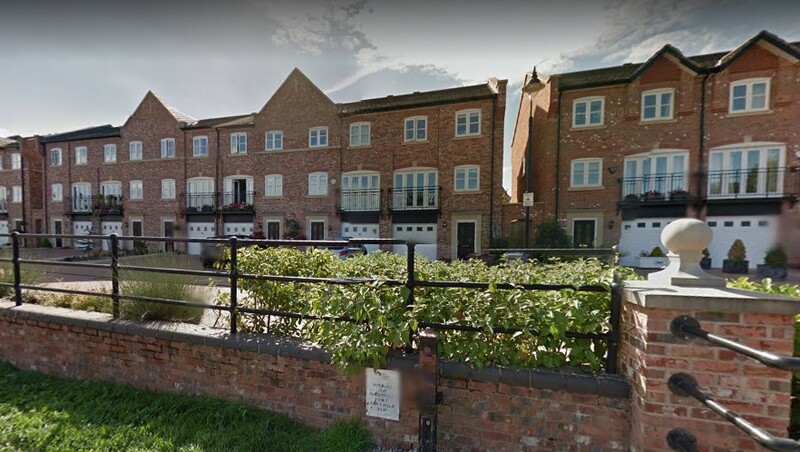 We then walked east to the Wardle, had lunch at the Kings Lock pub on the Trent & Mersey and then headed back northwards to recover our starting point. It was a relatively short walk (time didn’t permit us to take-in the lime lagoons) with kind ‘fresh’ weather. Nowadays, the ten-mile Middlewich Branch links the Shropshire Union mainline at Barbridge with the Trent & Mersey in Middlewich. 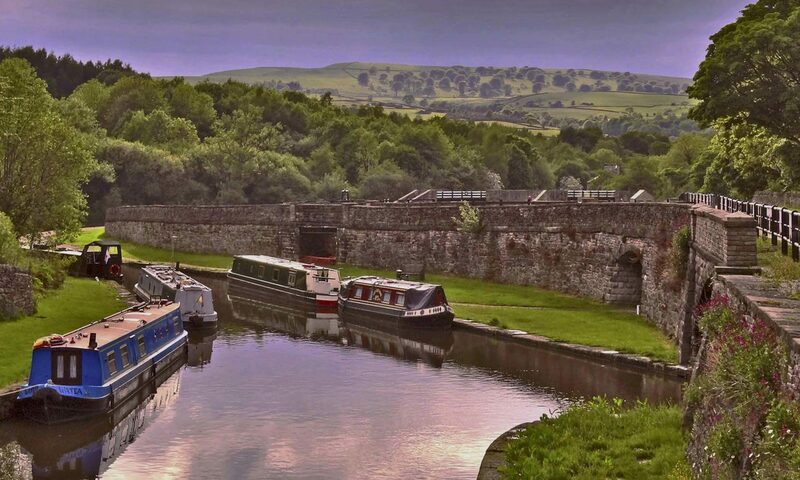 This through-route was made possible once the T&M company had built the Wardle Branch with its one lock: at 30m/98ft it is the shortest canal in Britain. 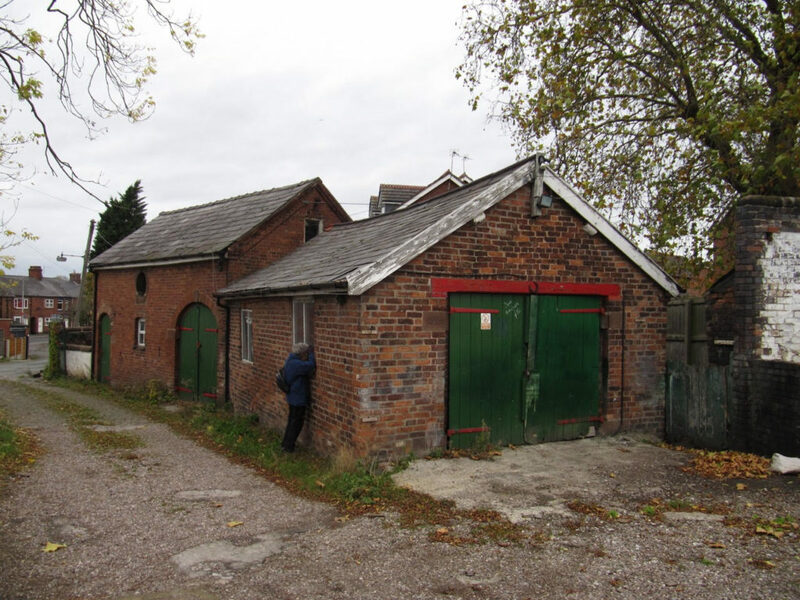 Prior to this, goods were transhipped from a wharf in Sutton Lane, Middlewich to the T&M. The practice continued even after the Wardle link was built because of the high tolls imposed by the T&M company. In truth, the Middlewich Branch has three aqueducts, all impressive undertakings. From west to east they are: over the River Weaver; over the River Wheelock; over the A530 Nantwich Road. We saw the road aqueduct because that was the point where we climbed to reach the canal. Once on the towpath, a few yards west we encountered The 2018 Breach, which was at the Wheelock aqueduct. Clive Mitchell, C&RT Project Manager for the North West, met us here for a guided tour of C&RT’s work to restore navigation after a disastrous breach in March. 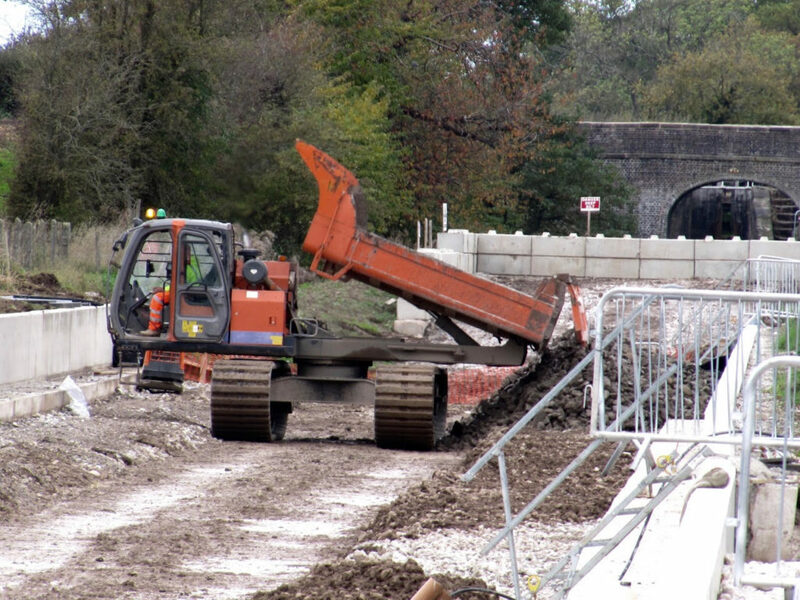 Note the dumper’s body rotates so it doesn’t need to turn round! This has gone on Mark’s Christmas present wish list. 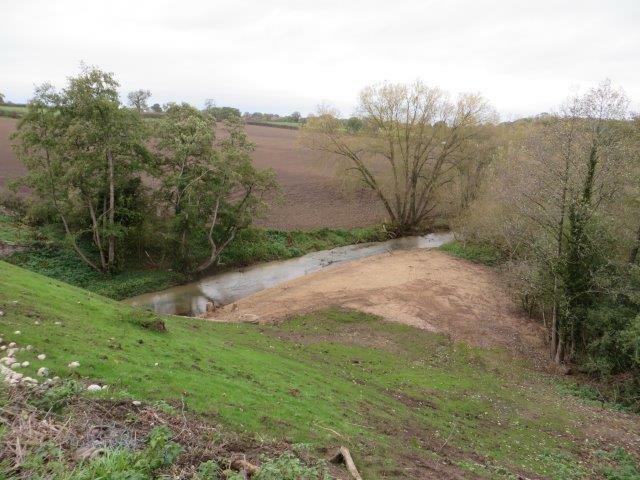 The bank had to be reprofiled and the aqueduct wall has been put back together – only one coper lost. 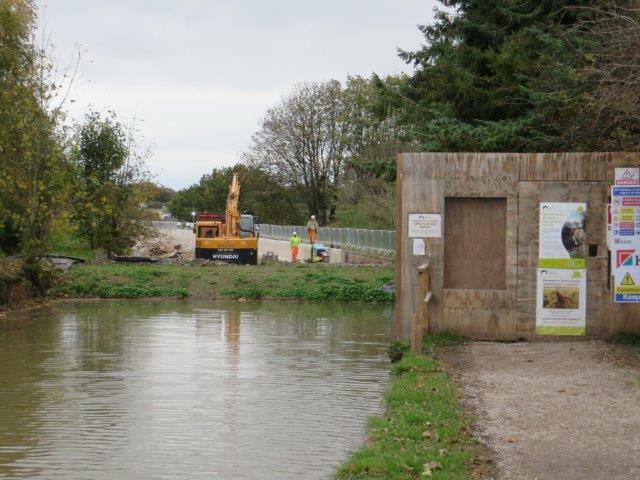 Work is on target, Clive told us, for a re-opening to navigation before Christmas. Armed with a laptop full of images of the repair’s progress, Clive gave us a comprehensive account of what happened, probably why it happened, and all the steps to prevent it happening again. The bill: £3 million, something like 10% of C&RT’s national budget for such eventualities. Much fundraising has been done, both locally and nationally and there are special thanks to the Postcode Lottery which has contributed a substantial sum. Clive Mitchell (2nd right) poses with the group on the towpath close to the breach point. 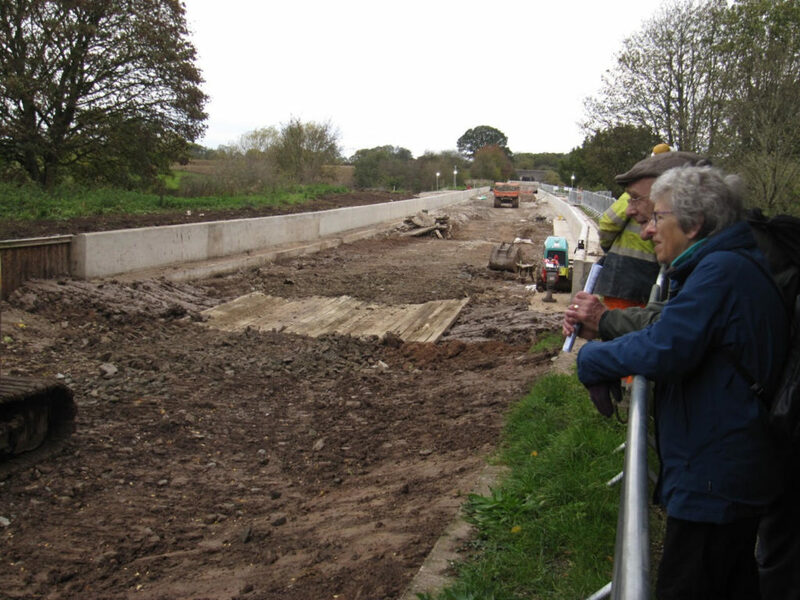 The journey from the breach area to the Kings Lock showed us the consequences of this disaster. The water level is down, perhaps by 0.6m/2ft and of particular note is the lack of any boats. There are residential moorings along here but the total loss of water in March meant that C&RT had to make arrangements to move stranded boats (and fish!) to elsewhere on the network. Wardle lock is still locked to prevent any passage along the Branch. 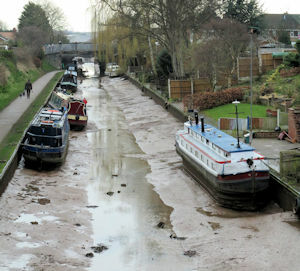 Of the fifteen boats caught-up in the breach, one was precariously close to the point where millions of gallons of water poured over, then through, the towpath down to the Wheelock valley below. Due to the severe accessibility constraints, it took three months before this last boat was craned-out to safety. 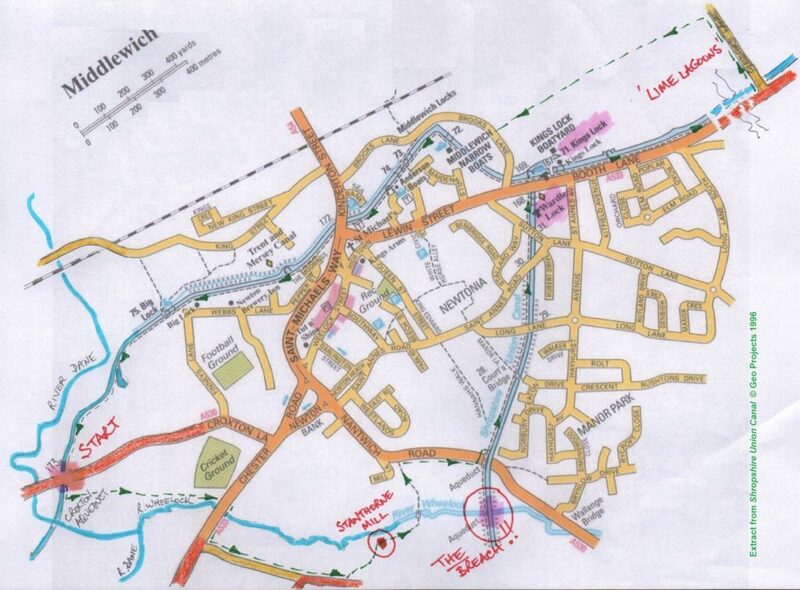 There is a series of information panels around Middlewich: Tales of Wych and Water Trail. We saw several on the walk and took particular note of the one at Wardle lock, or, rather, Maureen’s Lock. 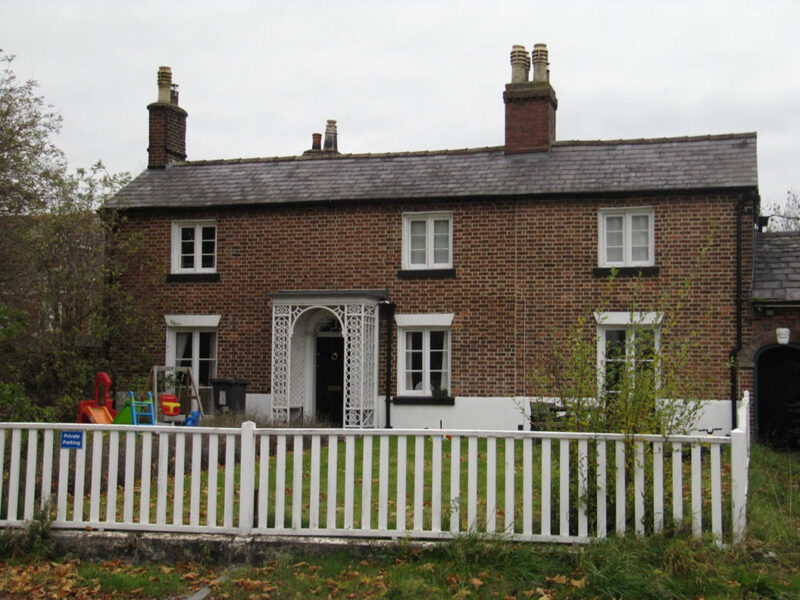 It’s called this in memory of Maureen Shaw who, in later life, lived in the lock-keeper’s cottage and assisted many a boatman/woman/person in these parts. The food and ale at the Kings Lock, also called the Cosy Tea Room, was excellent, if a little tardy. The delay did enable a few of us to visit the boatyards & chandlers nearby. As time was getting short we decided to return directly on the T&M to the start rather than walk south to see the moonscape of the old lime and salt lagoons. Last year, there were two major hireboat companies in Middlewich: Andersen Boats and Middlewich Narrowboats. Andersen is still very much in operation (and the company’s large fleet was evident below the bottom lock of the town’s three) but Middlewich Narrowboats is no more. Its demise has had a big effect on the local infrastructure with the corporate red & green livery seen on buildings, wharves and even a dry dock. The red & green can be seen on the stables and sawpit house in the cobbled Canal Terrace. 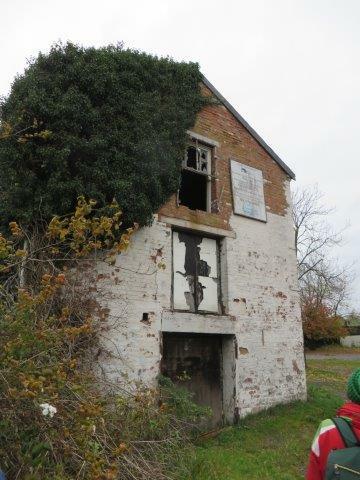 We took a short diversion to see these buildings as well as the Canal House & Canal Inspector’s Office. Canal House, still in C&RT’s ownership is, fortunately, still occupied. The rest of the area looks rather forlorn, awaiting its fate: note that many of these buildings are Listed. Once we were back on the towpath, we saw a ‘modern’ landscape, devoid of any major industry. Paul Hurley’s book Middlewich & Holmes Chapel through time (2010, ISBN 9781445601991) is an excellent source of early images of the district. Armed with the book, we were able to make-out the extent of past industrial activity along this section of the T&M such as: salt, of course; condensed milk production; the town’s gas works. Significant wharf buildings at Town Wharf and in use by BW in recent memory, lie deserted and decrepit. They need rescuing! The last major feature on our walk was the Big Lock, a name for both the pub and the lock itself. ‘Big’ because it’s a 14ft-wide lock, capable of allowing the passage of wide-beam boats, such as Mersey flats, closer to the centre of the town and the various salt works. Today, the construction of the third, narrow, aqueduct over the River Dane ½ mile north in the 1930s, has meant that wide boats can no longer get close to Middlewich. A long ribbon development of modern housing fronts the canal here, its style mimicking the general appearance of the Nestlé condensed milk factory that it replaced. We saw many interesting waterway features in this short walk, taking in three canals as it does. The highlight was undoubtedly the tour of the breach, enabling C&RT and BBHT/IWPS personnel to discuss issues wider than just the breach and its consequences. We have thanked Clive Mitchell most sincerely for his contribution to our day.